I love baking breads but the only task that really puts me off is all the kneading. No, still do not have a kneading machine. Hubby and I are trying to have more soups and salads for dinner. As the saying goes breakfast like a king, lunch like prince and dine like a pauper. We are trying to implement this, as light dinners are good before going to bed. However,not saying we follow this strictly but we do try. We do feel hungry again by 10 p.m. but don’t know who said that it takes 21 days to form a habit. So does it mean that if I skip one day the 21 count starts again? Whatever… so basically whenever we have soup for dinner, I try and make a different variety of bread. 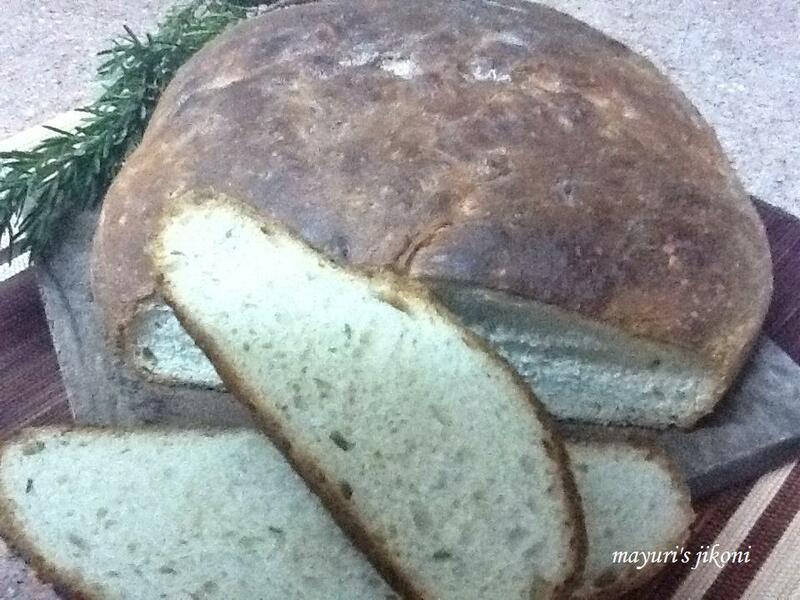 This recipe for potato bread is so easy to follow. I found it on the blog what’s megan making.com. Had to make a few changes but the bread turned out well. That is why I feel so proud. Its like those rustic breads that you buy from a bakery and not the supermarket. Go on be brave enough to try it out. Sieve flour into a big bowl. Add salt, sugar, rosemary and yeast and mix well. Rub the oil into the flour.Add the mashed potato.Mix well. Add all the water and form a dough. The dough may feel sticky. Rub a bit of oil into your hands and form the dough. Sprinkle some flour onto a board and knead the dough for nearly 10 minutes. The dough should be smooth and silky. Grease the bowl with oil. Form the dough into a round ball. Put the dough in the bowl. Cover with cling or plastic cover, put the bowl in a warm place and let the dough rise till its double the size. This may take about 2 hours. Knock down the dough and gently knead it again.Use some extra flour as the dough may be sticky. Let the dough rest for 10 minutes. In the meantime get your loaf tins (two 9X4 or one 9X5 inches) or a round tin (8 or 9 inch) or baking tray ready. Grease the container you are going to use. For this bread, I just rolled it up into a big ball and put it on the baking tray. Let the dough rise again for 30 to 40 minutes. Bake the bread for 35 to 40 minutes or until the top is golden brown. To check if its done, knock on top and bottom of the loaf. If it sounds hollow then its done. Use 2 cups of plain flour and 1 cup wholewheat flour. For kneading technique check out my recipe rosemary sunflower seed bread. Use any herb you prefer like mixed herbs, oregano. Make sure the mashed potato is cold and not warm or hot. But not fridge temperature. Warm mashed potato will result in the dough becoming too sticky. Brush the top with egg wash if you like. Egg wash is 2 tbsps of milk or water mixed with an egg. 1 sachet of yeast is 2¼ tsp of yeast. If you do not have the instant dry active yeast then you will have to mix the yeast and sugar into the warm water. Cover it and let the mixture become frothy. This takes about 5 to 10 minutes. Use this frothy mixture to form the dough. As soon as the loaf comes out of the oven, brush the top with butter. Tastes good.